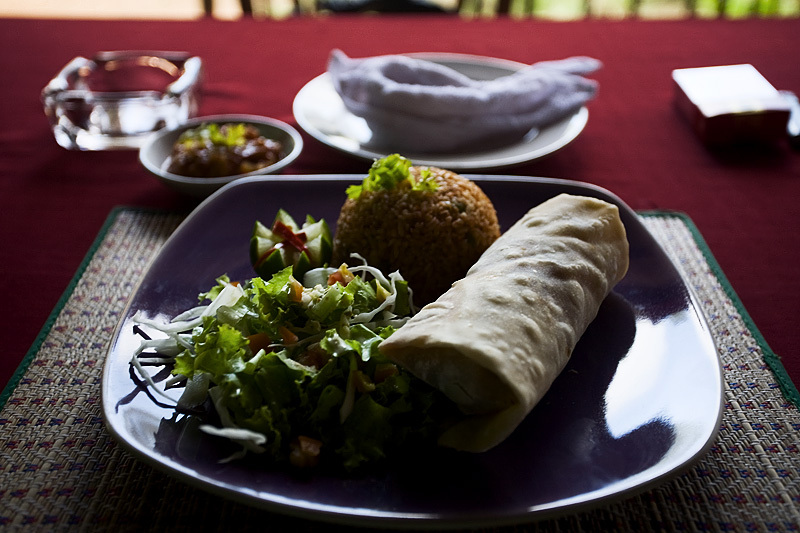 A Mexican burrito in the middle of Angkor Wat. One of the top reasons I liked living in San Francisco was immediate access to an incredible array of international food, particularly, my life-blood, Thai food. When I'm traveling, a variety often doesn't exist outside of the uninspiring slop served up at tourist restaurants. When a tourist eatery advertises "Chinees, Continental, Tibetan, South Indian, North Indian, Thai, & American Food" one thing is known for sure: they can cook none of the above. The incorrect spelling of 'Chinese' is a good indication of their carelessness. Enter an oasis of Mexican delights near Bayon Temple in the Angkor Wat temple complex. In a row of typical tourist trap stalls selling anything from mineral water to junk metal trinkets, there's one nondescript restaurant where you can order up a spicy quesadilla or beef taco. And when you require mouth numbing caliente, they deliver the spice (that burns you twice)! The owner informed me that a kind Mexican man took time and money to help him set up a stall that's completely different from the others. Over some time, the restaurant owner learned the necessary recipes and knowhow to prepare Mexican food from scratch thanks to one generous tourist. Sometimes I actually think there may be some good in the world, after all. If you're in the neighborhood, have a poke around for the Mexican restaurant stall near Bayon temple. It's non-India weekend already? Indeed. For those not "in the know," I use the weekends to give a short reprieve from my real-time India photos posts (i.e. or the country I'm currently in). Tune in Monday through Friday if you're interested in the subcontinent or stay tuned for one more day of archived non-India photos tomorrow. Nice shot of lunch... How odd to find this cuisine there! Angkor is on my list. Now I know what to expect! Thanks Andrew. This was a couple years ago. By now, there should be many more international options. Every time I've been back to Siem Reap, the entire town has advanced 20 years. Have fun and if you can, try to get the 1 week Angkor pass so you can take it all in without a rush.